Vitamin Water is normally yummy. My personal favorite is the Multi-V Vitamin Water. It has a lemonade flavor that sweet, but not overdoing it. There is one flavor I tried that you need to steer clear from. The Energy Tropical Citrus (to the left). Yuck! If you need some energy, just grab a Coke. This natural energy is not worth it, but everyone has their own flavor they like. 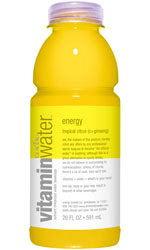 So try some Vitamin Water and tell me what you think!Do you know something else that is not so sweet? Republican presidential dropout, Mitt Romney, endorses John McCain. You should see the clip! They look so uncomfortable!